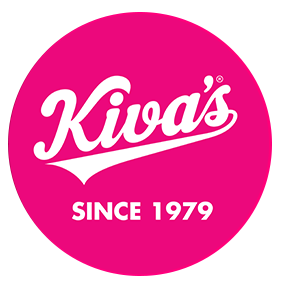 Kiva's Bagel Bakery & Restaurant | The Best Bagel Stop in Toronto! Served with a Kiva's bagel, large scoop with a twister. Swiss, Cheddar, Lappi, Havarti, Munchee. Scrambled eggs & fried onions. Two eggs, Israeli salad & cream cheese. Greek: Feta, Tomatoes, Peppers & Onion. Chopped salad mixed with feta, veggies, sliced egg and olives. Kiva's Greek dressing. Romaine, house Caesar dressing, topped with grated parmesan and homemade chalah croutons. Same great Caesar with roasted chicken breast. White albacore tuna, chopped veggies and lettuce. Herb dressing. 5% Cottage cheese & sour cream mixed with assorted chopped vegetables. Romaine lettuce, tuna, mixed peppers, mushrooms, peas, carrots, celery, crispy noodles & sesame seeds. Asian sesame dressing. Organic baby spinach salad, brie, tomatoes, mandarin oranges, slivered almonds & walnuts. Raspberry vinaigrette dressing. Iceberg & romaine lettuce, avocado, organic cheddar, grape tomatoes, kidney beans, black beans, corn & red onion. Sweet onion vinaigrette dressing. Romaine lettuce, roasted red peppers, sun-dried tomatoes, feta, artichoke hearts, cucumber & kalamata olives. Kiva's own Greek dressing. Romaine lettuce, cherry tomatoes, corn, avocado, roasted chicken & bleu cheese. Low-fat ranch dressing. Ask your server for an order form. Montreal oven roasted turkey breast. House roasted chicken breast with herbs. Roasted chicken, pesto spread and melted provolone. Cream cheese and lox with wasabi spread. Layers of tuna and cream cheese. Tuna and melted cheddar cheese on an open-face bagel. Hard boiled egg, green olives & hot sauce. Triple decker with lox, cream cheese, lettuce, tomato, cucumber and onion on black bread. Triple decker with tuna, lettuce, tomato, cucumber, onion & cheddar or Swiss cheese. Triple decker with smoked salmon, avocado slices and veggies. Triple decker with roasted red peppers & avocado, topped with grilled tomatoes, pesto & goat cheese. Roasted turkey breast, sliced avocado and veggies. Filled with premium cream & cottage cheese. Slices of Challah bread dipped in farm fresh eggs. To any entree only, no modifications. With Your Choice Of: cream cheese, tuna or chopped egg. Fat free yogurt with granola, fresh fruit & honey. Your Choice Of: Skim, 2%, Soy, Lactose Free. Mango, peach, pear, apple or strawberry banana. 2% or Skim or Chocolate.